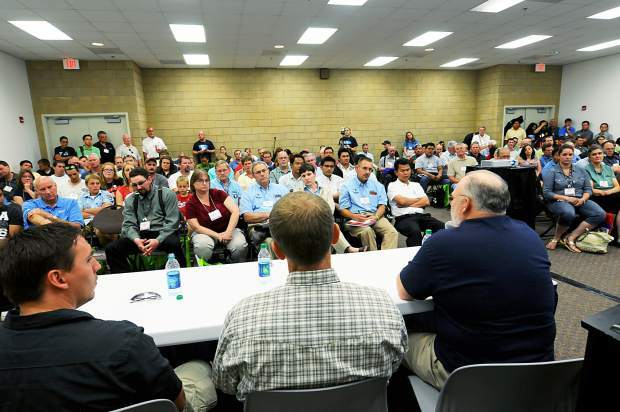 Gain insights and information at World Pork Expoâs seminars, which feature an interactive setting to get the answers you need to return home with new ideas. Photo courtesy National Pork Producers Council. World Pork Expo is a hub of information for pork producers and related professionals, and at the forefront is more than a dozen free seminars scheduled for Wednesday, June 4, and Thursday, June 5. From on-farm management ideas, to research updates and technology insights, the seminars provide useful information that Expo attendees can apply to their pork-production businesses back home. Presented by the National Pork Producers Council (NPPC), Expo will take place June 4-6 at the Iowa State Fairgrounds in Des Moines, Iowa. "The seminars provide valuable information and address the most current and pertinent topics that pork producers face," says Howard Hill, DVM, NPPC president and Iowa pork producer. "You can pick and choose which seminars to attend — there's something for everyone." Wednesday at 3 p.m., Purina Animal Nutrition, Zinpro Corporation and DSM will present Feeding for 30® — A focus on sow longevity. Producers, nutritionists and industry experts will share advice on consistent parity structures and achieving the goal of 30 pigs per sow per year. On Thursday, SFP will sponsor two sessions, at 9:30 a.m. and again at 10:45 a.m., featuring a panel discussion on cost-efficient manure management. Panelists will talk about minimizing phosphorus and nitrogen loss, and maximizing the agronomic benefits of applied manure. Among its many attractions, World Pork Expo features the world's largest pork-specific trade show, with more than 375 commercial exhibits, and at least 310,000 square feet of indoor and outdoor exhibit space. Trade show hours are 8 a.m. to 5 p.m. on Wednesday, June 4, and Thursday, June 5, as well as from 8 a.m. to 1 p.m. on Friday, June 7. The swine shows begin Tuesday, June 3, and conclude with the breeding-stock sales on Saturday, June 7. Additional information is available when you connect with World Pork Expo on Facebook, follow World Pork Expo on Twitter (#NPPCWPX), or download the official app by searching for "World Pork" in the Apple Store, Android Market or Blackberry's App World.